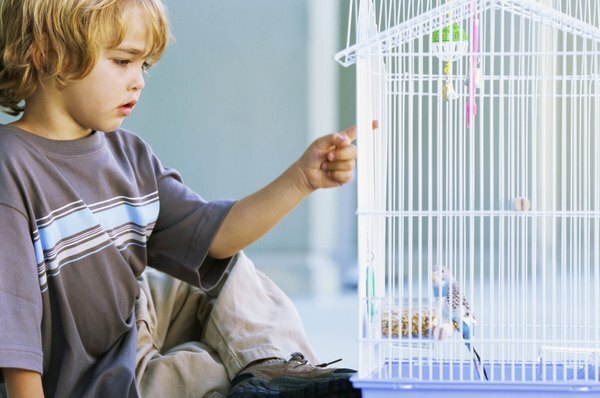 Caged birds can suffer nutritional deficiencies leading to shorter life spans. Cockatiels are tame and curious birds known for their crests. Wild cockatiels live in Australia, where they live in large flocks. Keeping pet cockatiels in crowded conditions can lead to disease and a shorter life span. So learn how to take care of these smart pets, because when healthy, they can be keeping you company for 15 to 20 years! Consider yourself your bird's chef, caterer, housekeeper and taxi service. You can help your cockatiel live longer by providing him with healthy food, clean living conditions and a trip to the vet if needed. Cockatiels are generally healthy unless kept in dirty, crowded conditions or fed incorrectly. Provide filtered sunlight during the day, fresh food and water daily, and clean your cockatiel's cage twice a week or more as needed. Remove uneaten fruit and vegetables from your bird's cage within a couple of hours of feeding. Your bird may be sick if he has dirty feathers, is sitting fluffed up in a corner of his cage or has watery eyes or diarrhea. Pet birds are often fed a convenient but "junk food" diet of packaged bird seed, water, and grit. Like humans, cockatiels depend on a variety of vitamins, minerals and proteins for staying healthy. Adding leafy greens, shredded carrots and hard-boiled egg yolk provide the healthy food needed for a long life span. Calcium is especially important for breeding female cockatiels, whose calcium stores can be lost over time by laying eggs. Give breeding birds plenty of oyster shell grit and cuttlefish bones. Captive birds can also develop a vitamin A deficiency. Shredded carrots and cooked yams can help boost vitamin A levels. Cockatiels are built for long haul flying; in the wild, they fly many miles daily looking for food and water. Pet cockatiels don't have the space for this kind of extreme workout. Combined with the cockatiel's active appetite, a lack of exercise can lead to a fat bird. Cockatiels can develop fatty tumors and other health problems caused by obesity. Putting your bird on a diet doesn't mean withholding his usual food, but avoid over-feeding treat foods and don't allow your cockatiel to eat junk food. If your cockatiel's wings aren't clipped, allowing him free flight within a familiar room can help keep him trim. Covering mirrors and windows helps with preventing in-flight collisions that can seriously injure or kill your cockatiel. Cockatiels can live 20 years or more if given proper care. Practicing common sense and household safety can add years to your bird's life. Never leave cockatiels unsupervised with small children or household pets. In nature, cockatiels are ground feeders. Pet cockatiels enjoy exploring floors but are easily stepped on and can become targets for dogs and cats when allowed to stay on the floor. Avoid placing your cockatiel in direct sunlight without providing a source of shade. Cockatiels enjoy being outdoors in their cages but require water and shade for avoiding heatstroke and dehydration. Your bird is too hot if he's panting and holds his wings slightly away from his body. If your bird seems sick or is injured, take him to the veterinarian right away. Birds instinctively attempt to hide illness, so if your bird looks sick, it's time to see your vet. cockatiel.com: How Do I Know When My Cockatiel Is Sick? Can I Put a Cockatiel With a Budgie? Should I Put My Cockatiel Cage in Front of the Window? How Does Music Affect Cockatiels? What Kind of Habitat Do Cockatiels Live in? How Long Does a Cockatiel Need to Stay With Mom? How Much Work Is a Gray Parrot?